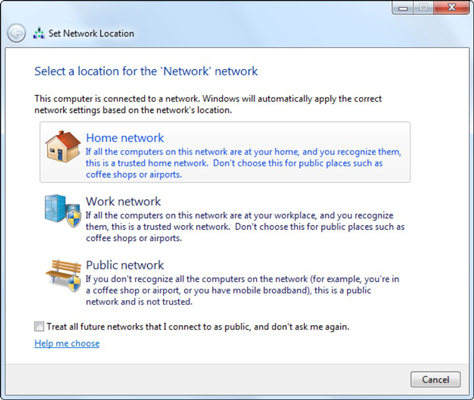 When you connect to a network, the main question that Windows asks is whether you’re connecting to a home, work, or public network? Windows uses the information to determine how secure your system needs to be. However, Windows 7 gives you the opportunity to go back and change a network type to suit your needs. Public: Windows 7 puts up your PC’s shields. Windows Firewall plugs almost all its openings and protects its internal programs for being connected to potentially hostile network. Work: Windows 7 opens the Windows Firewall so that you can communicate with other computers on your network and share folders, say, or use printers on the network. Windows also starts services that make your computer visible on the network. Home: Windows 7 goes out and looks for other Windows 7 computers on the network. If it finds other Win7 computers that have a HomeGroup going, it invites you to join that HomeGroup. If it doesn’t find one, Windows 7 asks whether you want to start one. Choose Start→Control Panel and, under the Network and Internet heading, click the View Network Status and Tasks link. 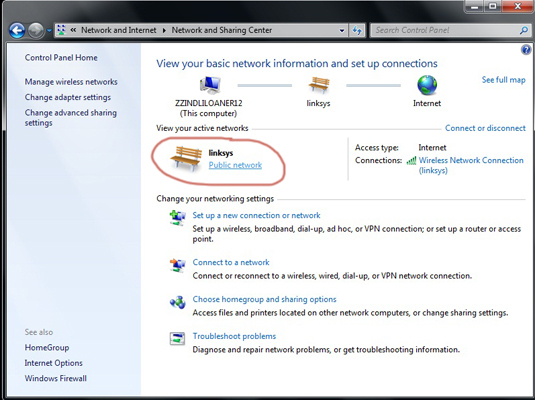 Windows shows you the Network and Sharing Center. In the box marked View Your Active Networks, click the link that mentions the network type you now have. In this case, we’ll click the Public Network link to change a public network to a home network, so we click the Public Network link. Windows shows you the Set Network Location dialog box. Choose the type of network you want to use. In this case, click Home so we can create a HomeGroup. The Set Network Location dialog box closes. When you switch to a home network type, Windows invites you to either start a new HomeGroup or, if a HomeGroup exists, join it.